When you are already working somewhere, you probably are considered to be on secret job hunting. So, for that you need to get time off from the daily routine so as you make your arrangements and makeup to the appointment successfully. Scheduling the interview yourself is the first and the foremost step. See yourself at what time you will be available to others. If you arrive late or early that will be acceptable but vanishing mysteriously is not good. This will certainly give an impression of something going fishy. So, schedule the whole process according to the convenience. If you have an interview a day after, you must inform your boss a day before so that no issue arrives on the spot. It usually happens that when something is demanded on the spot, it has the chances of getting rejected. So, if you know about the day, date and the time, then you can surely tell the boss for the off the next day. Even if you know the interview time, then also ask for the half day off as at times interview might start either very early or very late, overtime. So, always be on the safer side to reach on time. Tell your boss about the job hunting. Bosses usually know about that as it becomes the need of an hour for the employers especially if you are a newcomer. Be truthful, but vague. It means you can answer by saying that you have to handle some personal matters at home or you have some work related to your finances, or you have to go for the follow up appointments and so on. These things are but obvious and something real that could be understood easily. If you are a fresher or a recent college pass out, plan the day accordingly and in a very smart manner as the boss will come to know the reason behind it. So, do not make lame excuses instead either be true or be smart enough to ask for the leave. Going for the best day of the week will be the best idea. If your current office is not working on Saturday, and the one where you are planning to work in the future is working on Saturday’s then go with that option. It would be best and even you will not have to ask for the leave. Do not go for the busiest day, go for the day which is easy and light for you. This needs a lot of planning and the management. Time management is the basic need. One should know how to satisfy both the sides and this can only be done through the management of the time. You will surely know beforehand about the date and the exact timings, so plan and ask for the off accordingly. Do not lie instead be true. Maybe the truth leads to your happiness. Give priority to the most important task and then to the less important and finally to the least important. Even if you have your appointment outside the office, give priority to the office work and then move ahead. This is because if you will accomplish your own task at first, no one will stop you from getting the off. You know what are the most important things that are to be done. Complete those at first and then go ahead with a request to get the off. If you are done with the whole work you were assigned, the boss will probably have no issue in making you happy with a day off. Also the completed task gives the confidence and the chances of getting an off increase to 100%. So complete the whole work first and then step ahead for the off. Consulting the Human Resource department of the company will be a good idea if you are not able to make up for the plan. Human resource department will tell you the whole schedule and then you can manage the schedule accordingly. Many companies provide their employers with the outplacement assistance. See whether your company provides that or no. If it is there, then avail it and you will not have to go for the long process of asking for time off for interviews. You can also inform your company about the efforts you are putting to support the company regarding the job search. This will probably be the best time to disclose that you are actively seeking employment at other places. This way the boss will also be satisfied and even you will pass smoothly from the stony path. Requesting the senior is one of the other above mentioned ways. You can discuss the problem and ask for day off required. If it’s a personal work at home, you may require the whole day off and if it is the other work then you will have to know what are your requirements. Plan according to the requirements as it will help you in making the project a success. Realistic excuses are understood. You can say that you have a doctor’s appointment, or child or any family member is not well, you have got to meet the financial advisor, house issues, car trouble and so on. such things are entirely understood and no one will stop you from getting an off. So, by this you will be able to portray yourself in a true manner, thus making a great impression. If you give negative excuses, you probably get caught up later on. Be positive and give positive reasons. Positive reasons will not create any doubt while the negative ones will create a doubt and may result in spying. Do not create a hype over the matter. Just be simple and do not drag the story. Even if few questions are asked, answer them and then leave them as it is. Do not give an excuse and elaborate. Sometimes elaborating the stories can reveal inconsistencies within the stories and that can create trouble for you. Do not change the reasons one after the other instead stick to the one you have already made. You should remember what you told before, as you never know when you will have to be answerable regarding the same. If you slip while you are speaking, they may doubt you. So better to stick to the simple reason . If you will stammer, then you may create a doubt in the minds of the listener. Also be strong and bold enough to present the excuse. Also it should be valid and reliable enough to be believed by everyone. Confidence will reflect that you are true and the reasons you are giving are quite genuine. So, be confident while you are asking for an off. If you try and be manipulative, it will affect the level of trust between you and your staff. So do not be manipulative and instead be simple and straight forward. Being straight forward will help you in sailing the sea in a smooth manner. When you are manipulative, you tend to fumble and it shows that something is fishy and also when you are not true, you forget the reason very easily which again is a big loss. So try and be straightforward and instant instead of being manipulative and cunning. 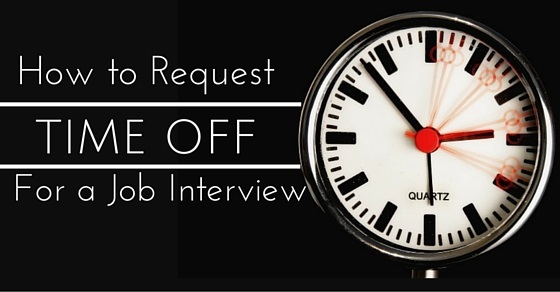 So, above are the ways by which one can ask for time off for interviews. Though it is very difficult to get an off while you are already working, yet you can ask for by looking at the policies and the conditions that the company holds. Do not go off way and stay on the track. Present the reason confidently and do not stammer while speaking. Be true and do not give fake reasons or you will be caught very easily.